Okay, so I have another fabulous blogger/sponsor stopping over this week to share a little about her local foodie life AND to giveaway away some island goodies from her home to one of you all! :) Jessica (aka, Duckie) lives on the island of Guam, and I am fascinated with this because my mother lived there as a kid for a couple of years while her father was in the Air Force and was stationed there. I can still remember my grandmother pulling out their projector and showing us a slide show of their life there. :) Please say hello to Jessica from Frikken Duckie and get yourself entered to win some spicy yummies! Hey all you Frugal Foodie Mama readers! I'm Duckie, a 20-something island girl blogging over at Frikken Duckie from the island of Guam. I'm so excited to be able to share my love for local Chamorro/Guamanian food with you today! 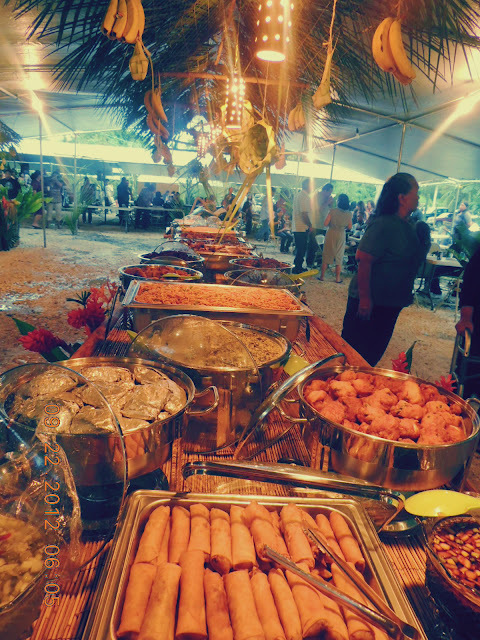 Here on Guam, the best place to eat at is at a Chamorro fiesta, or party. 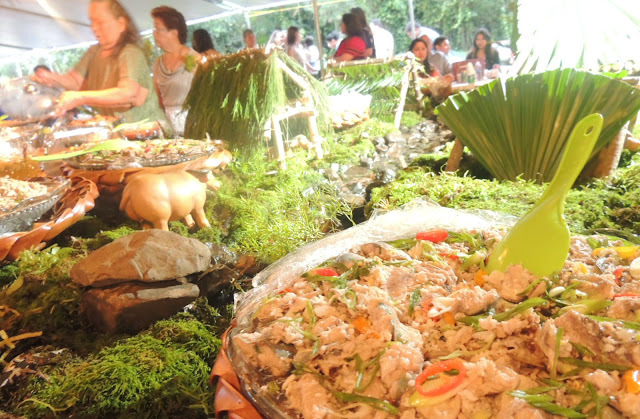 There is always an abundance of food and fun at a fiesta - it's what every foodie dreams of! 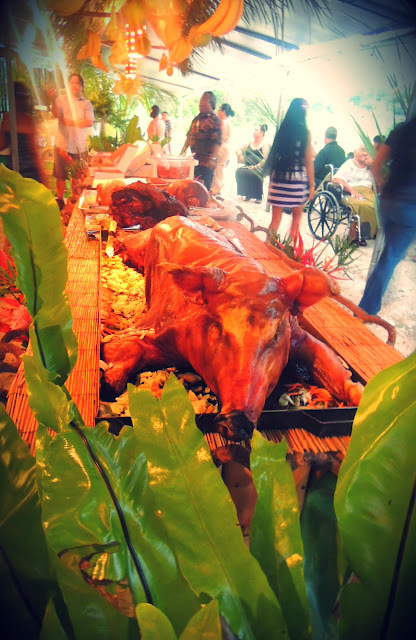 Some of the dishes you would typically see at a fiesta are Red Rice, Titiyas, Lumpia, Pancit, barbecued meats, Fritada, various seafood dishes, Kelaguen, Tamales Gisu, roasted pig, and Finadene. Looks good, doesn't it? And that's only two of the tables! 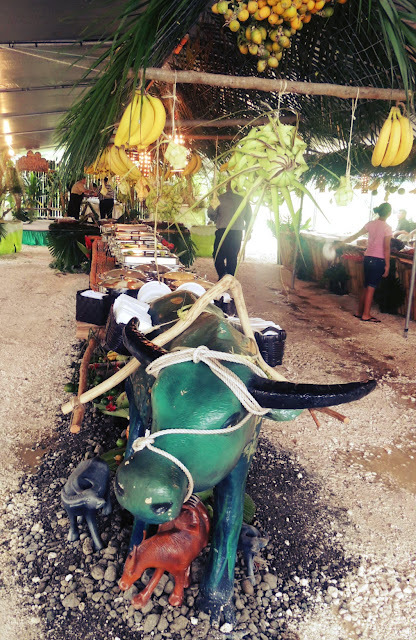 A typical fiesta spread consists of a main table, a seafood and salad table, a table for the pig and other large meats/poultry, and a dessert table. It is typical for people to have several plates full of food - I always have at least 3 - and fiestas tend to last all night so the food is kept in warmers or on ice to keep from spoiling. If I could, I would send you all a plate of food, but I think most people prefer to eat food that isn't spoiled or have mold growing on it, right? What I can do however is give away a large ad space on my blog for one month plus this super awesome finadene sauce set to one of you lucky readers! 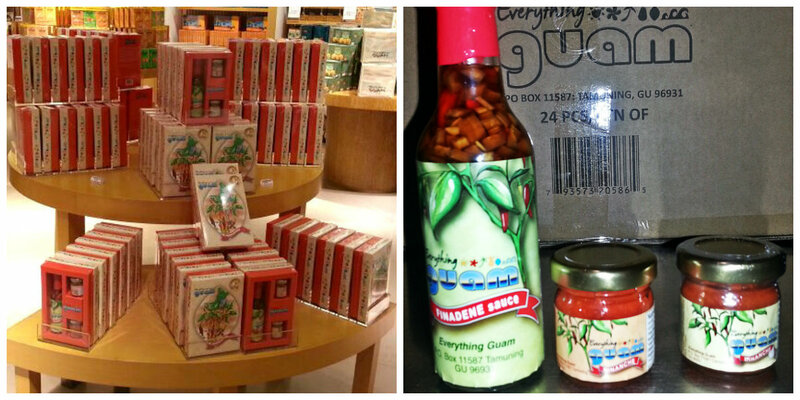 Finadene is a kind of sauce that local Chamorros use with just about everything. Basic finadene consists mainly of soy sauce, vinegar, onions, and peppers. This set is made by Everything Guam and comes with a bottle of finadene, plus two types of dinanche (smashed peppers). The dinanche adds that extra kick for all you spicy food lovers out there! Good luck to all of you who enter and thanks Carrie for having me! Awesome giveaway! I'd love to try those hot sauces. I wasn't able to find a link to her Facebook page on her blog and there isn't a link on the giveaway. Just an FYI. Thanks for the giveaway! The feast looks amazing!